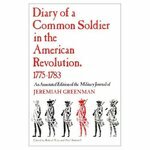 Bray, Robert and Bushnell, Paul, "Diary of a Common Soldier in the American Revolution, 1775-1783: An Annotated Edition of the Military Journal of Jeremiah Greenman" (1978). IWU Authors Bookshelf. 37.